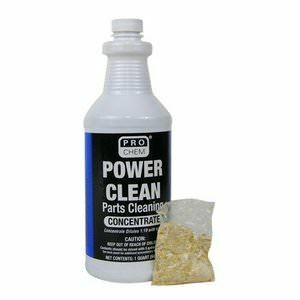 POWER CLEAN | Pro Chem, Inc.
Power Clean was developed to compete with hydrocarbon solvents. This parts cleaning concentrate dilutes 1:19 with water. It is a safe, highly effective, pH-neutral, water-based cleaning solution integrated with the natural power of microbial bioremediation. It is extremely safe and yet rivals solvents in performance, eliminates parts cleaning liquid waste stream and can save you money. It can be used on metals, plastics and many other materials. It has been certified by the South Coast Air Quality Management District (SCAQMD) in California as a “Clean Air Solvent.” This certification is the most stringent ever imposed by a regulatory agency for solvent degreasing compounds and requires that the solution contains less than 50 g/L of volatile organic compounds (VOC’s) and no EPA Hazardous Air Pollutants (HAP’s), Ozone-Depleting Compounds (ODC’s), or Global Warming Compounds (GWC’s). It cleans by penetrating through the soils to the part surface, where it reverses the ions of the soils, releasing them from the part to be cleaned (surface active surfactants). Surfactant blend cleaners leave the surface clean but not damaged. 1) Place 5 gallons of clean water in parts washer reservoir. 2) Pour 1 quart of Power Clean into parts washer reservoir. 3) Place one, 1 oz. water-soluble pack of microbes in the reservoir.